The United States of America has just completed its country-wide census held every 10 years. Census taking has been going on in the country a long time and not just of people. Back in the 19th century another census was done of the fossils of Waldron, Indiana. An area containing very fossilforous shale from the Silurian Period. In the years of 1878-79, researchers from the New York State Museum descended on the area and shipped about seven tons to their processing facility. 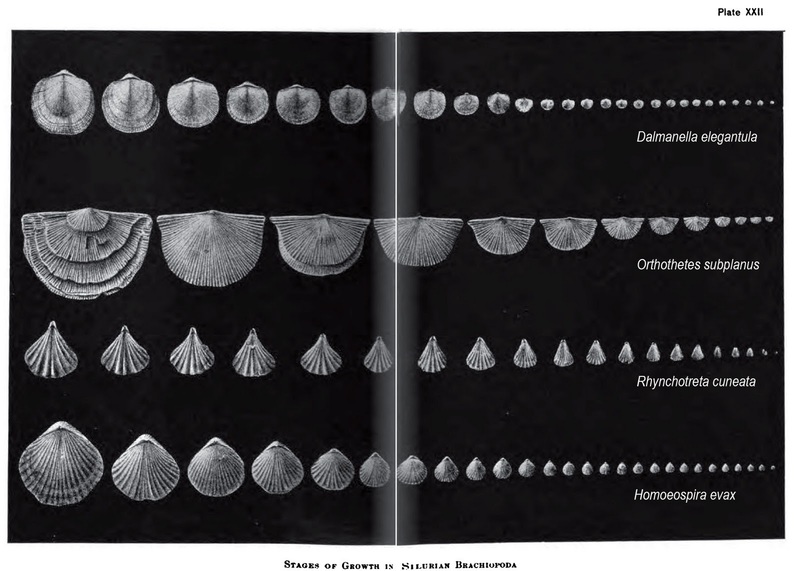 A specific research project was conducted to determine the growth patterns in brachiopods of this locale from the specimens collected. The plan was to separate the fossils from the matrix and established series of species showing their development from youth to maturity. When publishing this research, it was hoped to have photographic representations of these series by species. The paleontologists set out by washing the shale though different sized sieves. 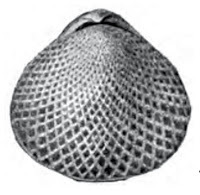 This process produced about 50,000 brachiopods (most less than 5 mm in length). These specimens were then sorted for study worthy product yielding approximately 15,000 fossils. Researchers determined that at least 150 species existed in the shale representing brachiopods, bryozoa, corals, sponges, crustaceans, gastropods, crinoids, annelids, cephalopods, and lamellibranchs. Due to unspecified difficulties, only one photographic plate was produced entitled "Stages of Growth in Silurian Brachiopoda". It has published in two halves but modern image processing reunites the image for your perusal. Four species are shown Dalmanella elegantula, Orthothetes subplanus, Rhynchotreta cuneata, Homoeospira evax. The authors note this "plate was drawn on stone from a photograph, and serves to show, not the details of structure, but the character and completeness of the material which has served as the basis of this work." 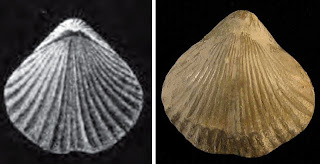 The following pictures are of three of the four brachiopods used in the growth comparison image shown previous. I do not believe I have found a Dalmanella yet. 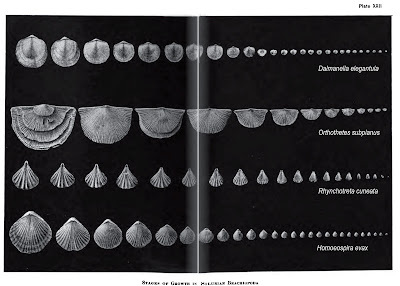 What I learned was the Homoeospira can slightly change appearance as it ages. In the past, I have seen variations thinking they were a different genus. The authors of this research point out in their summary that it is difficult to distinguish different juvenile brachiopod fossils. The research was presented in the Memoir of the New York State Museum pages 1-95 and plates i-viii published in 1889. by Charles Emerson Beecher and John M. Clarke. It was republished in 1901 in Studies in Evolution by Charles Emerson Beecher with updated brachiopod names.